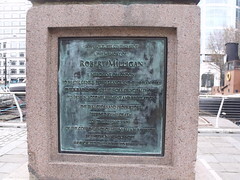 Robert Milligan (1746 – 21 May 1809) was a prominent Scottish merchant and ship-owner, and was the driving force behind the construction of the West India Docks in London. Having grown up on his wealthy family's sugar plantations in Jamaica, Milligan left Jamaica in 1779 to establish himself in London. living in Hampstead for a period. In 1809, the year of his death, Milligan owned 526 slaves who worked at his sugar plantation called Kellet's and Mammee Gully. To perpetuate the memory of Robert Milligan a Merchant of London, to whose genius, perseverance and guardian care the surrounding great work principally owes it's design, accomplishment and regulation. The Directors and Proprietors, deprived by his death on the 21st May, 1809 on the continuance of his invaluable services, by their unanimous vote have caused this statue to be erected.